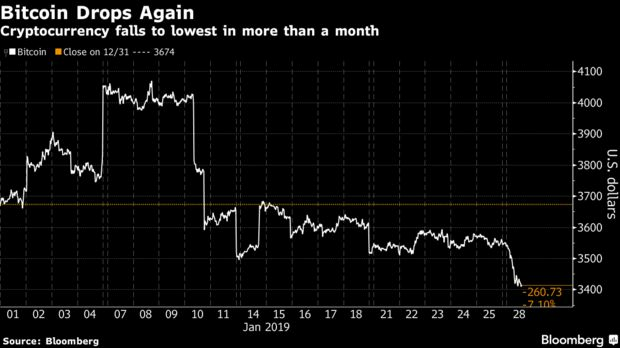 Bitcoin’s painful 2018 crash continues, with the original cryptocurrency touching the lowest in more than a month on Monday. It’s been a disappointing start to the year for crypto investors, who hoped that the pain of the downturn was behind them. More than $400 billion in market value was wiped out in the past 12 months as widespread adoption failed to materialize, according to data from CoinMarketCap.com. The total market capitalization is now about $113 billion. Meanwhile, the economics of the industry has come under pressure, with so-called miners finding the average cost of producing Bitcoin was more than its value. More work is being done to identify money launderingusing the asset class. The technical outlook doesn’t bode well for the bulls. Based on the GTI VERA Convergence Divergence Technical Indicator, the largest cryptocurrency just entered a new selling trend today for the first time since mid-November. The last time a sell signal was sent Bitcoin tumbled about 50 percent from $6,280 a coin to $3,156 over a nearly two-week span.